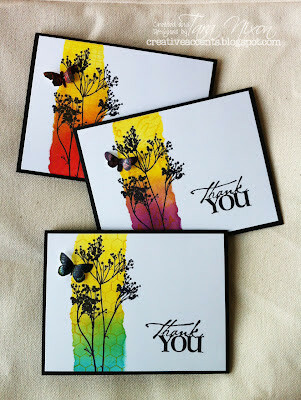 Check out this blog which has a monthly newsletter with instructions to help you make a 'SheetLoad' of cards. The newsletter includes measurements for a set of card fronts using a selection of patterned paper and cardstocks- this card here is roughly based on their July issue. This month they've added a 'Sheetload mini' newsletter mid month as well! My card features a bunch of fun new products: paper (double sided) by October Afternoon, Stamps by Stamping Bella & Hero Arts and the flower embellishment by Stamping Bella. I made this card for my girlfriend's lingerie shower coming up this week (shh... don't tell her!). The image is simply coloured with watercolour pencils and glitter glue added.